01. What are the hours of operation and locations for the Regional Landfill or Concord Turnpike Convenience Center? 02. Is the Regional Landfill or Concord Turnpike Convenience Center closed for the holidays? 03. I have recieved a violation on my Lynchburg City Trash cart, what do I do about it? 04. Where are recycling bins located in Lynchburg and Campbell County? 05. When is the next scheduled Household Hazardous Waste and Electronic Collection Day? 06. Can I dispose of shingles at the Livestock Road Regional Landfill? 07. What do I need to bring to the Livestock Road Regional Landfill or Concord Turnpike Convenience Center for proof of residency? 08. I am a resident of Nelson County or Appomattox County, where do I find information regarding trash disposal, recycling, or household hazardous waste? 09. What types of debris can I bring to the Livestock Road Regional Landfill or Concord Turnpike Convenience Center for free? 10. Can you tell me how much weight I have left to use for this month? 11. Do you have mulch? 12. Do you accept fluorescent bulbs? 13. How do I dispose of used tires? 14. How and where can I recycle my car? Can I dispose of shingles at the Regional Landfill? Yes. Individuals needed to dispose of shingles must bring them to the Region 2000 Livestock Road Regional Landfill and will be charged the current commercial tipping rate fee. What is the current commercial tipping rate fee? Can I bring concrete to the landfill? Concrete is considered an inert material as long as it does not contain metal reinforcement bar. Unlimited separated loads of inert materials such as clean dirt, brick, block, and concrete, without rebar, are accepted free of charge. Inert materials must be fragmented into pieces less than one cubic foot and brought in separate loads, meaning that it cannot be mixed with other household waste. If the material load is deemed unacceptable, you will charged the commercial tipping rate fee. How do I authorize a third-party hauler to charge to my commercial account? 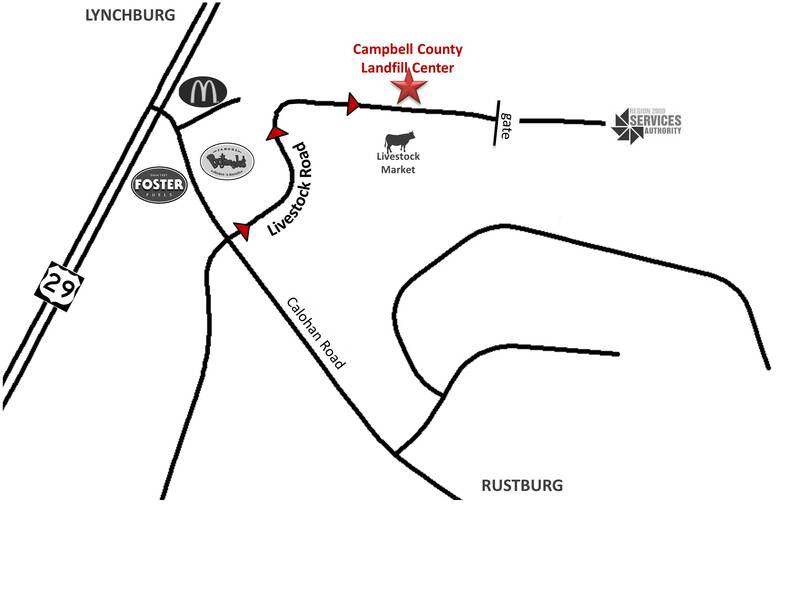 Residents of Campbell County or the Cityof Lynchburg who seek to dispose of dead animals must bring them to the Region 2000 Livestock Road Regional Landfill. Customers will be charged the commercial tipping rate fee. Dead animals will not be accepted at the Concord Turnpike Convenience Center or at any convenience center. May I bring debris of a parent or neighbor if they are a resident of the City of Lynchburg or Campbell County and I am not? Anyone, other than commercial businesses, may bring debris on behalf of another individual provided that you have their driver’s license or a current utility bill containing their physical address. What do I bring to the Region 2000 Livestock Regional Landfill or Concord Turnpike Convenience Center for proof of residency? Anyone wishing to dispose of waste at the Region 2000 Livestock Road Regional landfill or Concord Turnpike Convenience Center must present a valid Virginia State issued driver’s license or a current utility bill containing your physical address. Documents only indicating a Post Office Box are considered unacceptable as proof of residency. What debris can I bring to the landfill for free? The Concord Turnpike Convenience Center accepts brush, bulk and white goods, if not mixed with other debris, for free from City of Lynchburg citizens ONLY. The Region 2000 Livestock Road Regional Landfill accepts inert material ONLY for free. See Commercial Guidelines for more information on inert material disposal. How many pounds per month do residents get for free? Residents of the City of Lynchburg and Campbell County receive 500 pounds free per calendar month. There is no carryover from month to month of unused weight. Campbell County residents should always stop at the Campbell County Landfill Center or use the other county convenience centers. Can you look up my account and see how much I owe? Yes. Please contact our office at (434) 455 – 6086. Can I get a copy of my lost Waste Disposal Receipt? Yes. However, there is a $2.00 fee for each ticket less than two months old and $3.00 fee for tickets more than three months old. Can you tell me when I used the landfill last? Can you tell me how much weight I have left to for use this month? Why do residents have to pay when using the Regional Landfill? The Region 2000 Livestock Road Regional Landfill is operated by the Region 2000 Services Authority. 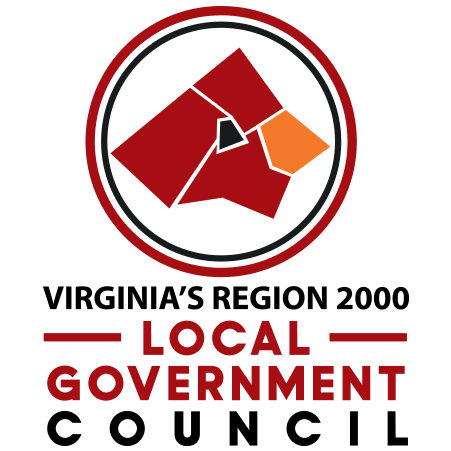 The Services Authority does not receive revenue generated from local, state, or federal taxes. All revenue for operational costs is generated from fees collected for services provided. I accidently dropped something of importance in the dumpster (wallet, cell phone, etc. ), can I get it back? Entering a dumpster to retrieve an item is not safe. We advise that you contact our office at (434) 455 - 6086 for further instruction. Is staff available to help me unload my car or truck? I live in Appomattox or Nelson County, where do I find information regarding waste disposal? What are the hours of operation for the Regional Landfill or Concord Turnpike Convenience Center (Lychburg City residents only)? Where is the Region 2000 Livestock Road Regional Landfill or Concord Turnpike Convenience Center? Is the Regional Landfill or Concord Turnpike Convenience Center closed for the holidays? See Location and Hours. Note: the Campbell County Landfill Center is open to Campbell County residents 365 days a year. What are the procedures for disposing of Asbestos Containing Material (ACM)? Asbestos or other special waste is accepted only at the Region 2000 Livestock Road Regional Landfill. Anyone that would like to dispose of Asbestos Containing Material (ACM), or other special waste, must complete and submit a Special Waste Disposal Request. All ACM or special waste must be brought to the Regional Landfill and prepared for disposal according to accepted guidelines. Additionally, anyone that would like to dispose of ACM or other special waste must notify the Region 2000 Services Authority 24 hours in advance. How do I dispose of latex paints? How do I dispose of oil-based paints? If the paint is still suitable for use, consider donating it to local charities, schools, or other community based organizations. However, if this is not an option oil-based paints should be disposed of by bringing them to the next scheduled Household Hazardous Waste and Electronic Collection Day. When is the next scheduled Household Hazardous Waste and Electronic Collection Day? Can I dispose of TV’s, small appliances and computer equipment other than on a Household Hazardous Waste Day and Electronic Collection Day? We strongly encourage everyone to recycle when possible. However, you may bring such items to the Region 2000 Livestock Road Regional Landfill however; it will be disposed of in the landfill. How do I dispose of diabetic needles? You should always handle needles and other pharmaceutical instruments with great care. We suggest putting them in a heavy plastic bottle, such as an empty bleach bottle or detergent bottle, which can be securely closed. Note: if any items are brought to the Landfill in a red medical waste container they will not be accepted. See Safe Disposal of Prescription Drugs. Also, each year, during the months of April and October, the Lynchburg City Police Department makes available a drop off collection barrel. Remember, it is not safe to flush medications down toilet or into other open drains. What can I bring to the Household Hazard Waste and Electronic Recycling Day? We encourage everyone to bring them to a scheduled Household Hazardous Waste and Electronic Collection Day for free or to check with local home improvement centers for other recycling options. However, for a fee of $.50 per bulb, they are accepted at the Concord Turnpike Convenience Center from Lynchburg residents ONLY and then, only providing there is not a large quantity of them (12 or less). Fluorescent bulbs are not accepted at the Region 2000 Livestock Road Regional Landfill. The Region 2000 Services Authority does not provide curbside trash collection services. Questions regarding residential guidelines for waste disposal/collection for residents of the City of Lynchburg can be answered by visiting Lynchburg City Public Works Department or contacting the City of Lynchburg at (434) 856 – 2489. This includes matters regarding recycling, leaf collection, bulk and brush collection, trash cart violations, collections, or decal purchase, and missed trash collection. Do you have mulch to give away? Is yard waste (grass clippings) or disposal of leaves free? No. Anything brought into the Region 2000 Livestock Road Regional Landfill, except for material specifically stated as being accepted at no charge, will be charged at the commercial tipping rate fee. Can I bring tires to the Landfill and what does it cost? The Region 2000 Livestock Road Regional Landfill does accept tires and each are charged according to its size. Tires with a 15” rim size or less are charged at $2.00 per tire, tires with a 15.5” to 22.5” rim size are charged at $4.00 per tire. Any tire with a rim size larger than 23” will not be accepted. Where are the recycling bins located in Lynchburg? Where are the recycling bins in Campbell County? Do you have recycling bins for plastic? There are no recycling bins at the Region 2000 Livestock Road Regional Landfill. Residents of the City of Lynchburg can bring their recyclables to any of the Recycling Drop-off Centers located in Lynchburg. Residents of other counties in the Region 2000 service area can find more information by visiting Recycling. Do you have recycling bins for glass? The City of Lynchburg and Campbell County do not provide recycle bins for glass. Recycling options, including glass, can be found at Recycling Facilities. How and where can I recycle my car? Though there are several possiblities of how one can recycle an old car, there is a program, Wheels for Wishes, that offers a free and easy way to recycle or donate unwanted cars, trucks, motorcycles, SUV's, RV's, or even boats, by turning them into a wish for a local child. Not only do the proceeds benefit Make-A-Wish Greater Virginia, but your donation is eligible for a tax deduction.